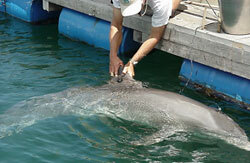 The dolphin’s hearing is being measured using an auditory brainstem response (ABR) test. The probes, attached to the animal’s head and back using suction cups, measure small electrical voltages produced by the brain in response to an acoustic stimulationNachtigall, P. E., Pawloski, J. L., & Au, W. W. L. (2003). Temporary threshold shifts and recovery following noise exposure in the Atlantic bottlenosed dolphin (Tursiops truncatus). The Journal of the Acoustical Society of America, 113(6), 3425. https://doi.org/10.1121/1.1570438Nachtigall, P. E., Supin, A. Y., Pawloski, J., & Au, W. W. L. (2004). Temporary threshold shifts after noise exposure in the bottlenose dolphin (Tursiops truncatus) measured using evoked auditory potentials. Marine Mammal Science, 20(4), 673–687. https://doi.org/10.1111/j.1748-7692.2004.tb01187.x. Photo courtesy of Paul E. Nachtigall, Hawaii Institute of Marine Biology. The basic mechanism of sound detection is the same in all mammals, whether they live on land or in the sea. Sound waves are transformed to neural impulses in the inner ear, which are interpreted by the brain as sounds (see How do marine mammals hear sounds? ). Exposure to loud sounds can interfere with this process and cause hearing impairment or loss. Scientists use various techniques to evaluate the effect of sound on marine mammal hearing. Hearing sensitivity can be measured using auditory testing methods similar to those used on humans and other terrestrial mammals. For more information see Hearing Sensitivity Studies. Hearing loss in humans has been extensively studied. Scientists can use what is known about hearing loss in humans and other land mammals to help understand hearing loss in marine mammals because the basic mechanism of sound detection is the same in all mammals.. Hearing loss in mammals depends on many factors, including ncluding the hearing sensitivity of the animal in comparison to the intensity of the sound, the frequency of the sound, and the duration of exposure to the sound. Humans exposed to extremely loud sounds (e.g., rock concerts, impulse noise from gunshots, etc.) experience temporary or permanent hearing impairment. Human hearing damage can also be caused by exposure to less intense noise over long periods of time, as in a noisy work environmentKryter, K. D. (1985). The Effects of Noise on Man, 2nd ed. Orlando, Florida: Academic Press.Rabinowitz, P. M. (2012). The Public Health Significance of Noise-Induced Hearing Loss. In C. G. Le Prell, D. Henderson, R. R. Fay, & A. N. Popper (Eds. ), Noise-Induced Hearing Loss (Vol. 40, pp. 13–25). New York, NY: Springer New York. https://doi.org/10.1007/978-1-4419-9523-0_2. Hearing impairment does not occur if the frequency of the sound to which the animal is exposed is outside the range that the animal can hear. The softest sound that an animal can hear at a specific frequency is called the hearing threshold at that frequency. If an animal is exposed to sound below the threshold of hearing, the animal cannot hear the sound. The animal can hear sounds that are above its threshold without impairment until a certain combination of intensity and duration is reached. Above this limit, the animal’s threshold of hearing may be temporarily or permanently worsened. When this happens, sounds must be louder in order to be detected. If the threshold returns to near normal levels after some period of time, this condition is called a temporary threshold shift or TTS. If the threshold does not return to near normal levels, the effect is called a permanent threshold shift or PTS. PTS can occur as a result of repeated occurrences of TTS, or it can occur as a result of a single exposure to a very intense sound. 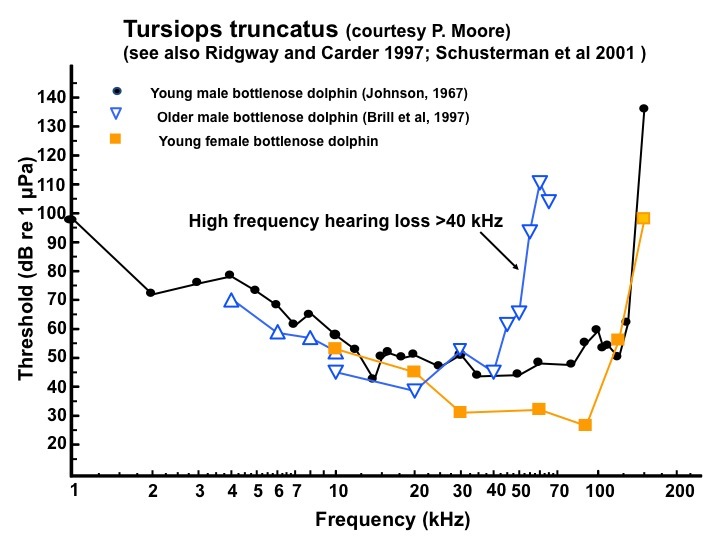 Hearing threshold curves of three bottlenose dolphins showing the range of natural variability in hearing sensitivities, as well as the loss of high frequency hearing that can occur with age. Figure courtesy of Darlene Ketten, Harvard Medical School. One study exposed bottlenose dolphins and beluga whales to signals at frequencies of 400, 3,000, 10,000, 20,000, and 75,000 Hz that lasted for one second. The received levels (estimated at the position of the animals ear) required to cause TTS were generally between 192 and 201 dB re 1 µPa, except for one dolphin that exhibited TTS after exposure at 182 dB at 75 kHz. The data from this study are plotted in the following figure. The highest received level that was tested at the 400 Hz frequency (193 dB re 1 µPa) did not produce threshold shifts in any of the animals, as ndicated by the dashed line. Minimum received levels required to cause TTS in bottlenose dolphins (green circles) and beluga whales (blue triangles) for 1-second tones at a number of frequencies. No TTS was observed after exposure to 400 Hz tones for the highest received level achieved, 193 dB re 1 µPa, which is why there are no symbols. Reprinted with permission from Schlundt, C.E., Finneran, J.J., Carder, D.A. and Ridgway, S.H. 2000. Temporary shift in masked hearing thresholds of bottlenose dolphins, Tursiops truncatus, and white whale, , after exposure to intense tones. Journal of the Acoustical Society of America 107(6): 3496-3508. Copyright 2000, Acoustical Society of America. The amount of data on hearing loss in marine mammals is limited. TTS studies have have been limited to a few individuals of a few species. No research has been conducted on PTS in marine mammals. Estimates of the intensity levels that might cause PTS must be extrapolatedNational Research Council (U.S.), & National Academies Press (U.S.) (Eds.). (2005). Marine mammal populations and ocean noise: determining when noise causes biologically significant effects. Washington, D.C: National Academies Press. https://doi.org/10.17226/11147. The majority of data on marine mammal hearing has come from studies of the anatomy of the ear of different marine mammal speciesNachtigall, P. E., Supin, A. Y., Pawloski, J., & Au, W. W. L. (2004). Temporary threshold shifts after noise exposure in the bottlenose dolphin (Tursiops truncatus) measured using evoked auditory potentials. Marine Mammal Science, 20(4), 673–687. https://doi.org/10.1111/j.1748-7692.2004.tb01187.xFinneran, J. J., Schlundt, C. E., Carder, D. A., Clark, J. A., Young, J. A., Gaspin, J. B., & Ridgway, S. H. (2000). Auditory and behavioral responses of bottlenose dolphins ( Tursiops truncatus ) and a beluga whale ( Delphinapterus leucas ) to impulsive sounds resembling distant signatures of underwater explosions. The Journal of the Acoustical Society of America, 108(1), 417–431. https://doi.org/10.1121/1.429475. The content on DOSITS is based on well understood scientific principles, peer-reviewed literature, and high quality sources of scientific data. Independent experts who specialize in underwater acoustics have reviewed the material in this section. National Research Council (U.S.) (Ed.). (2003). Ocean noise and marine mammals. Washington, D.C: National Academies Press. Scheifele, P. M. (1987). Hearing and acoustical behavior data from captive beluga whales at Mystic Marinelife Aquarium. NUSC T.R. 8730. White, M. J., Norris, J., Ljungblad, D., Baron, K., & Di Sciara, G. (1978). Auditory thresholds of two beluga whales (Delphinapterus leucas) (Technical Report H/SWRI 78-109). San Diego, California: Hubbs/Sea World Research Institute and Naval Ocean Systems Center. 3. ↑ Kryter, K. D. (1985). The Effects of Noise on Man, 2nd ed. Orlando, Florida: Academic Press.